The past year was one of those seismic shifts in the video-game industry that we only see once or twice a decade. The cause? 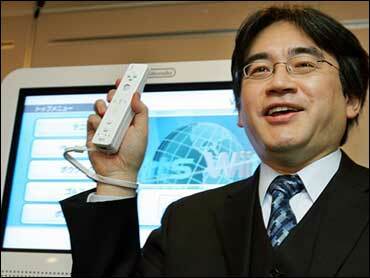 Two new consoles: Sony Corp.'s PlayStation 3 and the Wii from Nintendo. But they didn't arrive until November, and even now, they're not very easy to find unless you're really impatient and don't mind getting ripped off on eBay. Besides, it might be worth waiting until there are more systems to go around: Some of the year's best games came out long before anyone had developed a case of "Wii Elbow." BEST GAME: "Elder Scrolls IV: Oblivion." It has monsters, dungeons, swords and sorcerers, so on one level it might seem like "Oblivion" is hardly an original, praiseworthy game. But it is. The seamless presentation of a living, breathing, 3D world that's open for exploration is beyond anything that's been done before in a video game. Rated M, $59.99, Xbox 360, $49.99 Windows PC. BEST FIRST-PERSON SHOOTER: "Gears of War." The Xbox 360 console gets another stellar action game in this short but supremely satisfying shoot 'em up. It's an intense, graphically stunning game of humans against aliens that turns the genre on its head by forcing players to flank and duck for cover instead of mindlessly shooting. Rated M, $59.99, Xbox 360. BEST PORTABLE GAME: "LocoRoco." Sony's PlayStation Portable finally received a great, original game this summer with "LocoRoco." Heaps of cuteness, creativity and charm made what could have been another boring platformer into one of the year's most original and irresistible video games. Basically, you get to move an ever-growing blob around the bizarre levels by tilting the world left or right. It sounds weird, and it is — in a very good way. Rated E, $39.99, PlayStation Portable. BEST GAME FOR THE OLDER CONSOLES: "Okami." Next-gen may be all the rage, but the old video game consoles still have some fight in them. "Okami" is proof. The epic "Final Fantasy XII" was a close second to this fantastic work of art for the PlayStation 2 by Capcom. "Okami" got the nod, though, for its brilliant game design and dreamlike visuals. As AP reviewer Lou Kesten said: "It's unlike anything you've ever seen in a video game, and it's breathtaking." PlayStation 2, $39.99. BEST EXCUSE TO GET OFF THE COUCH: Nintendo Wii. Anyone who plays the included "Wii Sports" will almost certainly come to the same conclusion: this thing is really fun! Seriously, button tapping can't compete with this system's intuitive, tactile remote controls that must be swung around. Just be careful: Nintendo is looking into reports that the remote straps can break in the heat of the action and turn into dangerous projectiles. MSRP $250. WORST CONSOLE LAUNCH: PlayStation 3. Sony Corp. had already delayed its much-hyped uberconsole twice this year, then botched the launch with only a few hundred thousand units available. The result? Chaos among the clamoring masses and a bunch of mostly empty-handed gamers. Sony still insists it will have a million units available by the end of the year, but it should have had that many on hand Nov. 17. We're willing to overlook the $600 price, however, if only we could find one: it's still darn cheap for a Blu-ray movie player. MSRP $600 or $500 depending on version. WORST INDUSTRY TREND: Micropayments. Apparently, the idea of giving enthusiastic gamers the tools to freely create and share their own levels and items for video games on the consoles isn't profitable enough. This was the year when video-game companies began offering these extras for a few dollars each, instead. These so-called micropayments may help pad the earnings reports of big game publishers, but with top titles now fetching $50 to $60, it just seems greedy. WORST SPORTS GAME: "Torino 2006." The official video-game version of this year's Winter Olympics was a drab series of snowy events that suffered from a lackluster selection of competitions and flaky controls. The action here was about as much fun as watching ice cubes form in the freezer. Just another rip-off game disguised as a "budget" title. $19.99, PC, PlayStation 2, Xbox. WORST VIDEO GAME MOVIE: "Stay Alive." When will someone in Hollywood wake up and realize that video games are meant to be played, not turned into movies? Apparently not in 2006, which saw the ill-fated flop "Stay Alive." The premise is something a team of monkeys could have devised (who knows, maybe that's how it happened): players who die in a new video game end up dying in the real world, too.